I’m at a loss. Risotto does plenty for my appetite, but fails to inspire a decent title for this post. 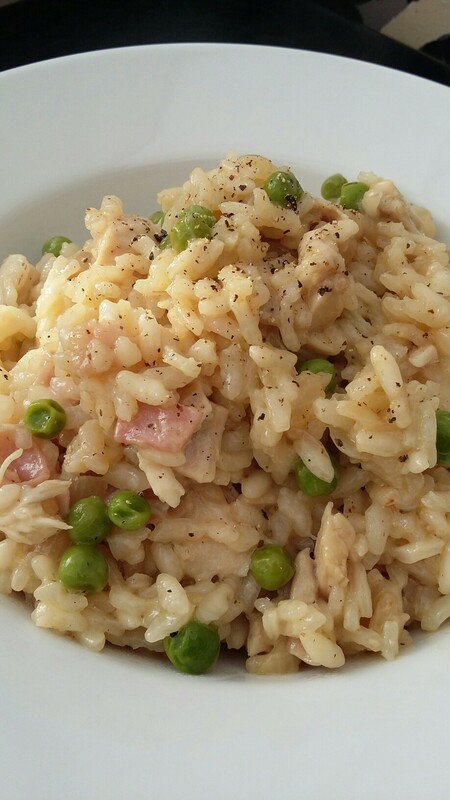 In risotto’s defence, it is a superb dish for using up ingredients, and that’s good news towards the end of a week. Is it a regular on our menu at home? Nope. Risotto doesn’t lend itself to nightly meals with children around. Like children, it requires close attention and this alone relegates the dish to weekend cooking. Take your eye off the pan and the rice will begin to crisp and burn without more stock. 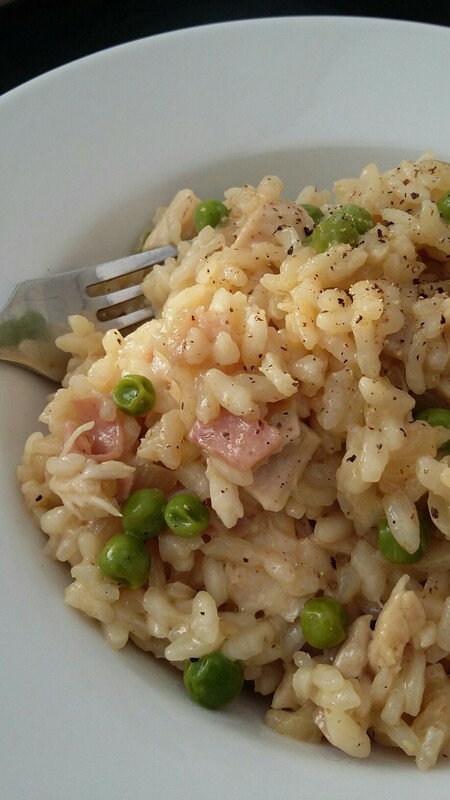 The resulting crust, which is sought after in a paella, ruins a risotto completely. Slow, slowly. Risotto is not something to be rushed. Choose ingredients carefully and add them at the right time for a satisfying result. The ingredients listed here do not all contain measures because the risotto can be altered to suit tastes. For example, I love black pepper and always add more than some people would like. Start by removing all of the meat from the cooked chicken thighs and cutting it into smaller pieces for the risotto. I tend to discard the skin. Set the chicken aside. Heat a couple of tablespoons of the olive oil in a frying pan and add the rice. Stir until coated with the oil and cook on a low heat. Add a little butter. When the rice is opaque, add the onion and stir well again. Add the wine and cook for two minutes. As the onion softens, pour in some of the stock and stir. Continue to add stock as it is absorbed. Don’t let the rice burn. Stir gently and add the frozen peas and the ham. Keep the heat low and add the chicken pieces and some seasoning. Taste the rice every now and again to see if it is cooked through. Add more seasoning and butter if necessary. When the rice is soft, take it off the heat and stir in the grated Parmesan. Beautiful! 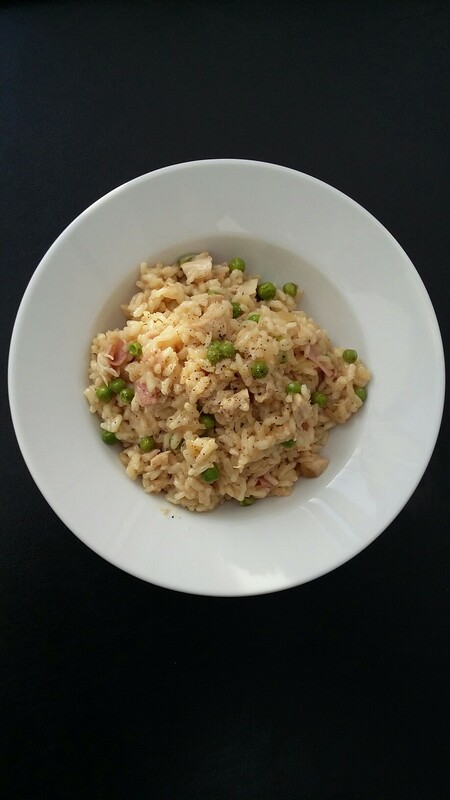 This entry was posted in Chicken and parmesan risotto and tagged Arborio, Butter, carbs, dinner, food, ham, lunch, peas, rice, risotto, Slow Food, supper by Dimitri @ The Last Piece of Cake. Bookmark the permalink.